Chronic fatigue syndrome (CFS) can have a devastating effect on a woman's life and relationships. Unlike normal tiredness and fatigue, chronic fatigue syndrome is a long-term, incurable form of intense fatigue that does not improve with rest or sleep. While there is no cure for this condition, there are medications for chronic fatigue syndrome that may help manage symptoms. 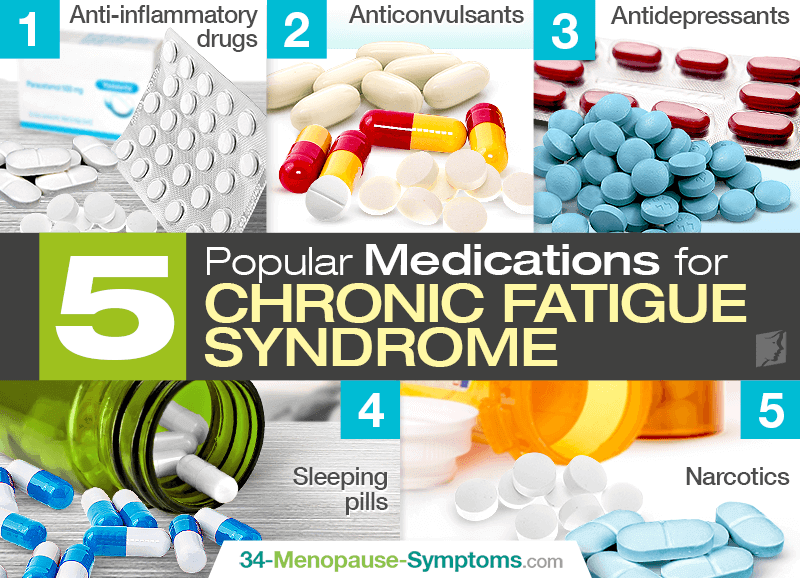 A doctor can help you decide which of these five popular chronic fatigue medications is right for you. Over-the-counter pain medications and anti-inflammatories, such as ibuprofen or acetaminophen (i,e; brand names Advil and Tylenol), can often help to manage the pain that may accompany chronic fatigue syndrome. Headaches, a common symptom of fatigue, are often relieved with the use of these non-prescription pain drugs, as are the muscle and joint pain that may go along with the overwhelming fatigue. These medications, also commonly used to help prevent seizures, are sometimes prescribed for disorders that cause problems both with pain and with sleeping. These drugs can be used as medication for fatigue and tiredness, because they seem to affect the brain in a way that reduces fatigue. They are also especially useful for treating nerve pain. Antidepressants are often used to improve sleep and to increase energy, since depression often causes problems with sleeping and with energy levels. Additionally, antidepressants can serve a double purpose with chronic fatigue syndrome; many people with this condition develop depression as a result, so antidepressants can help reduce symptoms of chronic fatigue as well as treat the depression it may cause. In some cases, it can be difficult to fall asleep, which only makes the tiredness and exhaustion of chronic fatigue syndrome worse. When this happens, a doctor may prescribe sleeping pills to help you get the full amount of sleep each night. While sleeping is not likely to eliminate your fatigue, it will improve symptoms. When chronic fatigue syndrome causes extreme pain, a doctor may prescribe narcotics to help relieve the symptoms. This happens only in the most extreme of cases, as narcotics are highly addictive and are a last resort. They may also help induce sleep, but should not be used primarily as a sleeping aid. A doctor should be consulted before using any of these popular chronic fatigue syndrome medications. In many cases, a doctor will need to prescribe the medications, but even over-the-counter drugs should be taken with a doctor's knowledge. Additionally, for those who would prefer to avoid using medication when possibly, there are different therapies available, both physical and psychological. Learn more about facts about chronic fatigue syndrome. Many women going through menopause suffer from fatigue. Keep reading to learn how fatigue can be fought. It is common for people to occasionally feel fatigued, and some of this can be connected back to our diet and what we eat. keep reading to learn more.